BMW G310 GS - everything you need to know | IAMABIKER - Everything Motorcycle! BMW Motorrad says that anything with the GS badge is a promise – a promise of perfect functioning, reliability and robustness. The BMW G310 GS transfers these qualities to the below 500cc capacity segment, embracing them in its own distinctive, mature interpretation. Recently BMW confirmed that both the G310 R and the G310 GS will be launched in India only in mid 2018 at a price point where the current KTM’s are placed. The BMW G310 GS can be identified as a genuine GS at first sight. With its characteristic, high front fender, striking flyline and short, high rear, the BMW G310 GS features classic elements of its big GS sibling models. Its compact proportions with a short wheelbase, a 19-inch front wheel and extended spring travel make for a typical upright posture, promising an agile, nimble riding response. Like the G310 R, the G310 GS is also designed for the world market. It takes diverse fuel qualities as well as meeting all emissions standards and local requirements. It is at home on all the roads of the world, bringing the hallmark BMW premium aspirations to the segment below 500 cc. 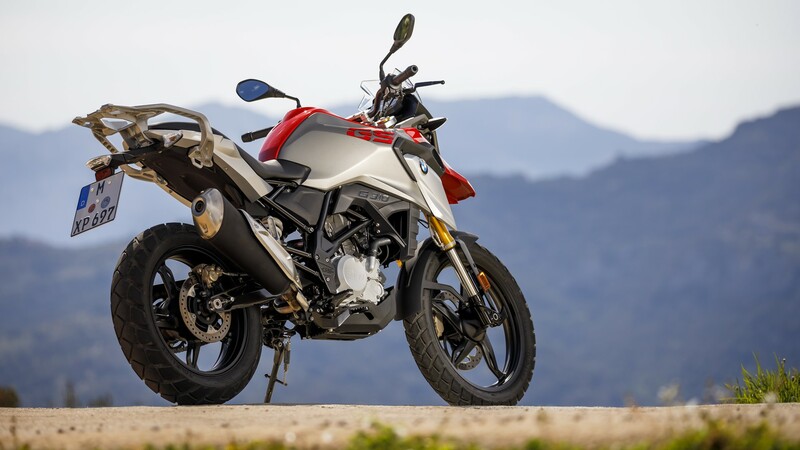 The centrepiece of the new BMW G310 GS is the 313 cc liquid-cooled single-cylinder engine known from the G310 R with four valves and two overhead camshafts together with electronic fuel injection. The capacity of 313 cc results from a bore of 80 millimetres and a stroke of 62.1 millimetres. A salient feature of the single-cylinder engine in the BMW G310 GS is the fact that its cylinder is tilted to the rear and its cylinder head is rotated by 180 degrees: intake at the front, outlet at the rear. This configuration follows the logic of a straight, power-enhancing supply of fresh air-fuel mixture and also has positive consequences in terms of the bike’s architecture. With an output of 25 kW (34 hp) at 9,500 rpm and a maximum torque of 28 Nm at 7,500 rpm, the engine of the new G310 GS is the ideal partner for dynamic riding pleasure, in conjunction with the low unladen weight of 169.5 kilograms. This engine concept with the intake side at the front makes for a generously sized intake silencer positioned directly behind the steering head and a newly designed, very short fuel tank. This prevents any excessive sloshing of the fuel back and forth, so undesirable reactions to uncontrolled shifts in weight are avoided. At the same time, this set-up and the preservation of an advantageously short wheelbase allows for a longer swinging arm, thereby ensuring a stable ride response. The new BMW G310 GS provides a relaxed seating position that enables carefree motorcycling pleasure both on the road and during excursions along forest paths and gravel tracks. As is characteristic of BMW Motorrad, all switches and controls are simple and secure to handle. Great importance was attached to simple and safe operation, taking into account the most diverse rider anatomies. 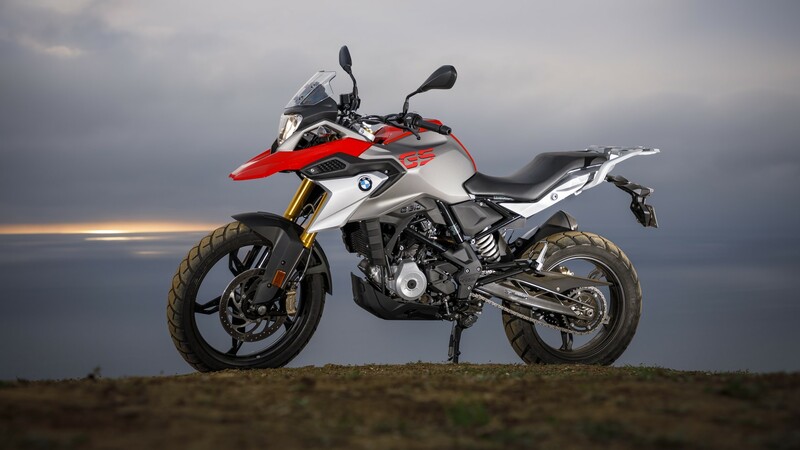 In terms of its suspension, the new BMW G310 GS is similar to the G310 R roadster in using a tubular steel spaceframe with bolt-on rear section that combines torsional rigidity with robust quality. Given its good stiffness balance, this provides the basis for excellent ride stability and a precise steering response. The front wheel suspension is taken care of by a solid upside-down fork while at the rear there is an aluminium swinging arm in conjunction with a spring strut that is mounted on it directly. The new BMW G310 GS is fitted with 5-spoke light alloy die-cast wheels; the front wheel is 19 inches in size for a safe, dynamic riding response on a variety of different surfaces (G310 R: 17-inch). Due to the larger wheel diameter, the wheel axis has been shifted forward in order to ensure an optimum, handling friendly castor. As in the G310 R, a 17-inch wheel is mounted on the rear. The tyre dimensions are 110/80 R 19 at front and 150/70 R 17 at rear. The exhaust system has been redesigned for use in the G310 GS. The manifold layout has been altered from that of the G310 R roadster so as to do justice to the longer spring travel and the rear, while a newly conceived heat shield underscores the hallmark GS character of the new G310 GS. Like all BMW motorcycles, the new G310 GS comes with ABS as standard. It combines a high-performance brake system with 2-channel ABS for efficient deceleration and short braking distances. For use over light terrain the ABS in the new G310 GS can be conveniently deactivated at the press of a button if required. And finally like the G310 R roadster, the new G310 GS has an instrument cluster with a large LCD screen that offers excellent readability and a wide variety of information. The displays include the following: engine speed, road speed, gear, total kilometres, engine temperature, fuel tank level, remaining range, average fuel consumption, average speed and time.